We have reopened in the Butler area and now have Chilly Water on tap! People with a passion for authentic Pennsylvania food. When my husband and I moved out to Indiana in 2007 to be closer to my parents, we quickly realized that we missed the delis and hoagie shops that we grew up loving in South East PA. With a degree in Restaurant and Hospitality Management from Penn State University in 2002, I pursued a General Managment position at Elbow Room and a few years later became Operations Mananger for the LUX Restaurants in Indianapolis. 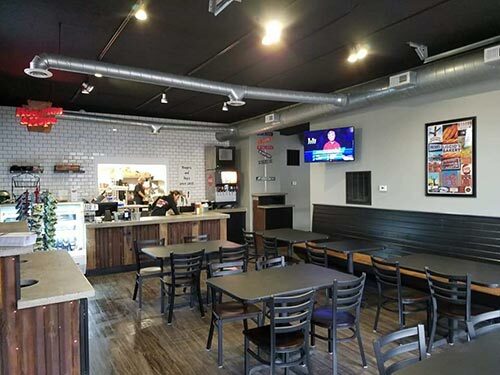 After many years of having family and friends from back east send us PA grub, I decided it was time to bring it here for all Indianapolis to enjoy. With Bread coming from South Jersey, meat, pickles and chips coming from Philly and the heart of Pennsyvania Dutch Country we hope to give our new home of Indy a taste of what South East PA comfort food is all about. 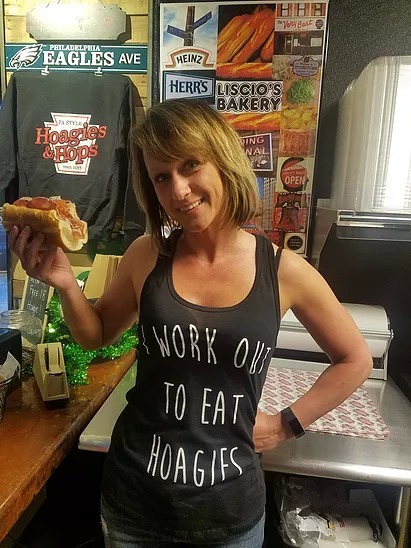 A big thank you to our family and friends from PA to Indiana who have supported us and a special thanks to my husband and parents for all of their help in my opening of Hoagies and Hops. 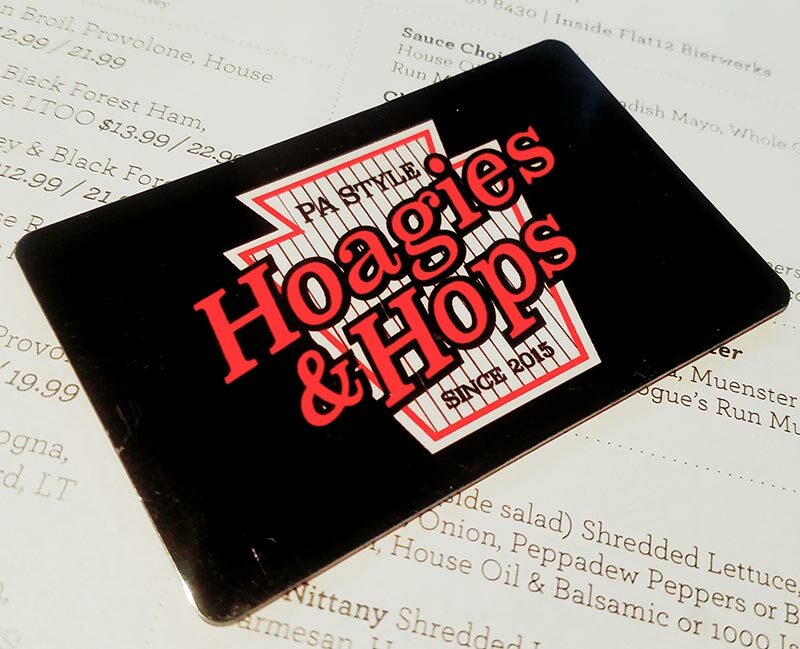 Give the gift of Hoagies & Cheesesteaks! To purchase our gift cards, you can stop by our shop, call, or email and we will mail them to anywhere in the US! Find out about weekly deals, events, and contests! 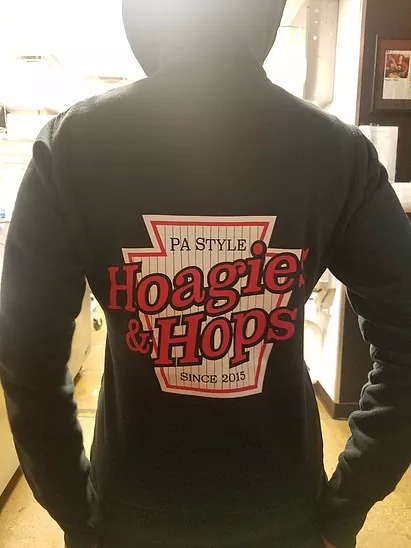 Come on by and pick up some Hoagies & Hops swag! Grab a shirt for $15, a tank for $16, or a hoodie for $25! 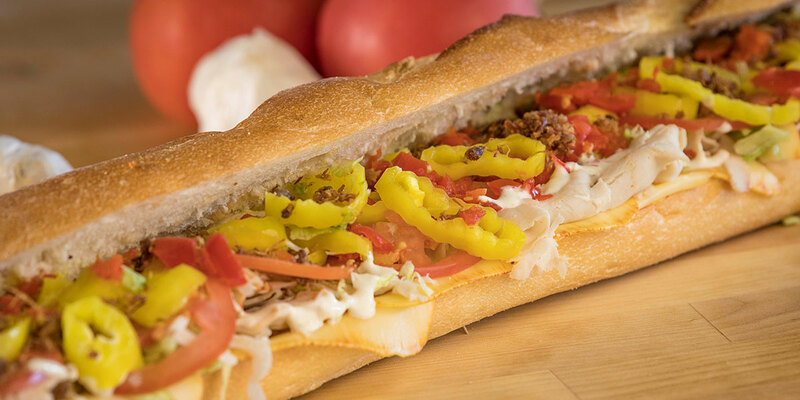 Hoagie Definition: Built-to-order sandwiches filled with meat and cheese, as well as lettuce, tomatoes, and onions, topped off with a dash of oregano-vinegar dressing on an Italian roll. A true Italian Hoagie is made with Italian ham, prosciutto, salami, and provolone cheese, along with all the works. It was declared the "Official Sandwich of Philadelphia" in 1992. The Hoagie was originally created in Philadelphia. 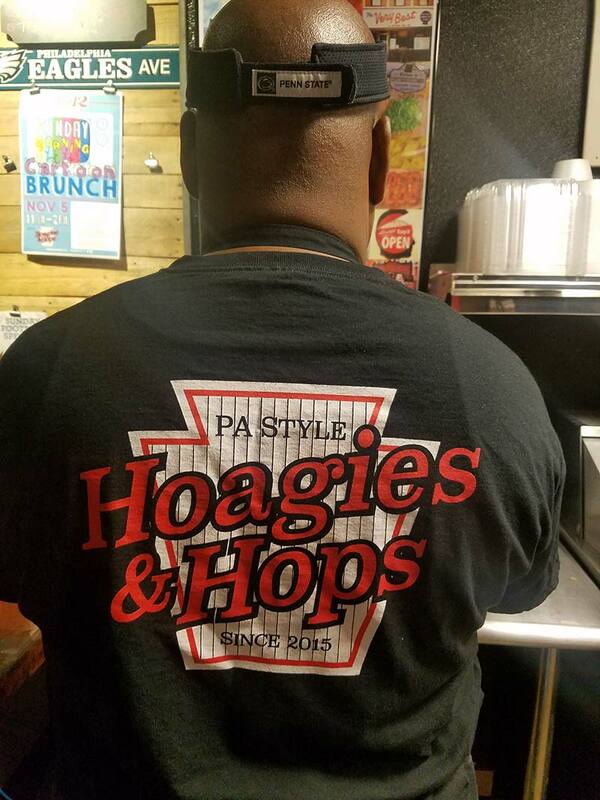 There are a number of different versions to how the Hoagie got its name, but no matter what version is right (historians cannot seem to agree on the correct version), all agree that it started in Philadelphia or the city's suburbs. The most widely accepted story centers on an area of Philadelphia known as Hog Island, which was home to a shipyard during World War I (1914-1918). The Italian immigrants working there would bring giant sandwiches made with cold cuts, spices, oil, lettuce, tomatoes, onions, and peppers for their lunches. These workers were nicknamed "hoggies." Over the years, the name was attached to the sandwiches, but under a different spelling. Another version on this story says that workers at Hog Island did bring this type of sandwich for lunch, but it was never called a hoagie. The story goes, that one day an Irish worker, who everyday carried an American cheese sandwich, looked enviously at his co-workers’ lunches and said; "If your wife will make me one of those things, I’ll buy it from you." The man went home and said to his wife "Tomorrow, make two sandwiches, one for me and one for Hogan," his co-worker’s name. So everyone started calling the sandwich "hogans," which eventually got shortened to hoagie. In 1925, Augustine DiCostanza and his wife, Catherine, opened their grocery store called A. DiCostanza's grocery store in Chester, Pennsylvania. According to the family lore, the grocery store stayed open well past midnight to accommodate the gamblers who held card games at the Palermo's Bar on the same street. One summer afternoon back in 1925, one of the men who cut the game decided to take a break and he walked into the store to get a pack of cigarettes. Catherine was cooking in the back kitchen and the aroma penetrated throughout the store. The man asked for a sandwich. "OK, pick out what kind of lunchmeat you want," she said. He said: "Put everything you have in the case on it." Catherine took a long loaf of hearth baked bread, sliced it lengthwise and proceeded to put on all of the lunchmeat... "What are you cooking that smells so good?" the hungry gambler asked. "I'm frying sweet and hot peppers," she replied and without asking she put a few pieces of the pepper on the sandwich. He left and an hour later the place was filled with hungry gamblers asking for a sandwich. It was the beginning of a new creation, soon to become know as the Hoagie." The last story says that during the Depression (1929-1939), out-of-work Philadelphian Al DePalma went to Hog Island near the naval shipyards to find work. When he saw the workers on lunch eating their giant sandwiches, his first thought was, "Those fellas look like a bunch of hogs." Instead of applying for a job at the shipyard, he opened a luncheonette that served these big sandwiches. He listed them on the menu as "hoggies" named for the hogs he saw during that lunch hour. During the late 1930s, DePalma joined forces with Buccelli’s Bakery and developed the perfect hoagie roll. By World War II during the 1940s, he turned the back room of his restaurant into a hoagie factory to supply sandwiches to workers at the shipyard. DePalma became know as "The King of Hoggies." At some point after World War II, the "hoggie" became the "hoagie." It is said that because his customers kept calling them hoagies, he changed the name. Philadelphia International Airport now sits on the land that was once Hog Island. Stay up to to date with our latest news. We promise not to send you any spam or sell your info to anyone.